Everyone has appointments or obligations from time to time, be it school, doctor's appointments, meetings or language courses in the afternoon. Some people manage to keep all their appointments in their head while others have to rely on tools like calendars to remember them. 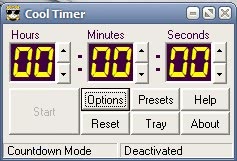 One specialized tool is a timer application which counts down until the event is about to begin. Timers can be used for other purposes as well like learning a language for the next hour or timing the cooking perfectly. Cool Timer is one of those timer applications that can be used as a countdown timer, alarm clock or stopwatch which covers everything that can be done with a timer. The timer application can be set to a maximum of 99 hours, 59 minutes and 59 seconds which only makes sense when in countdown mode. The options control most of the program's features like setting the alarm options. Alarm options can be set to play a sound either from build in sounds or from audio files located on the computer with the option to loop the audio file indefinitely until the user reacts. Alternatively, or in addition, a message can be displayed which the user can define. The message is showing up in big letters centered on the screen. The application can be minimized to the system tray where it will run silently until the set criteria is met. The timer application needs about 1.6 Megabytes of computer memory in the taskbar and about 2.5 Megabytes in the System Tray. I was just about to comment something similar. That gives the specific details on the application you mention. Bummer – timers are not that easy to come by! I’ll pass on this one.